Brojen Das was detected to have cancer in June 1997. However, it took few months for pathologist of Kolkata and Mumbai to come to a conclusion about the exact nature of the cancer. It was finally diagnosed as Non Hodgkin’s Lymphoma. His treatment started with chemotherapy. 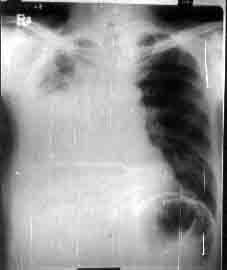 However, the first chemotherapy had a severe adverse side effect, which resulted in massive pleural effusion. No further chemo was possible and he was put on palliative care. 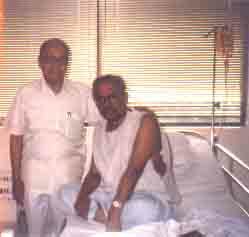 With Dr. K B Bakshi in Gamma Centauri Clinic, Kolkata 1998. His family members were interested to try a popular alternative cancer therapy called ‘Psorinum’. It is homeopathic therapy advocated by Dr. Ashim Kumar Chatterjee. Brojen Das himself wanted a mild form of cancer therapy and was very pleased to try Psorinum. He responded positively to the therapy and gradually his effusion dried up and there was a significant improvement in his general condition and quality of life. While undergoing treatment he could realize that many cancer patients are unable to afford conventional treatment because of the cost. Also some have adverse reaction to the anticancer medicines. Complementary and alternative medicines have a bigger role to play in such situation. He wanted his son-in-law Dr. Sanjoy Kumar Pal to take up research work in this direction. Later, when his conditions improved considerably as per the advise of his friend Dr. K B Baksi he was again put on mild chemotherapy. Brojen Das survived about a year after the detection of cancer. He was 71 when he passed away. A substantial part of Brojen Das’s treatment cost was borne by the Govt. of Bangladesh. The news that Brojen Das is no more with us was covered in various news-papers from this country and abroad. Calcutta, (PTI): Veteran Bangladesi swimmer Brojen Das, who had created a record of sort by successfully conquering the English Channel six times, is suffering from throat cancer. Das, who was the first Asian to cross the English Channel in the late 50’s, had recently come to Calcutta for treatment and the ailment was detected after investigation in a city hospital. Family sources said that doctors had advised the swimmer to get treatment done in Mumbai. He will be leaving the city in a week’s time. 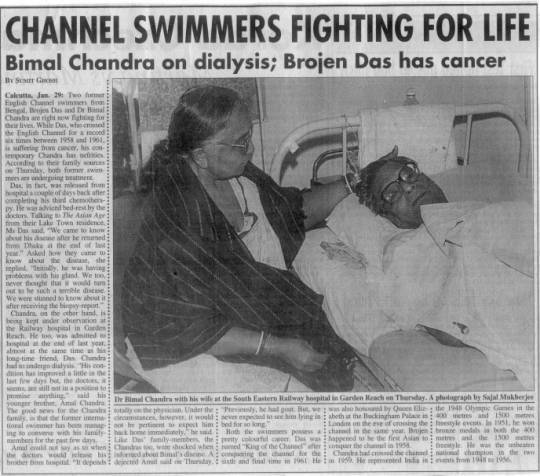 Brojen Das, a legendary swimmer of our country, has been under treatment at a clinic in Calcutta, reports UNB. 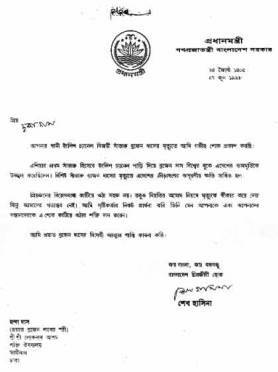 Prime Minister Sheikh Hasina has already inquired about his health condition and extended her help for his treatment. Brojen das become famous by crossing the English Channel in record time in the 50’s. She urged the people of Bangladesh to pray for his early recovery, said a handout yesterday. Ace swimmer Brojen Das, world famous for his record France – England Channel crossing in 1959, has been released from a Calcutta hospital and is presently under treatment at his family home there. Mr. Das (71) who has had heart by-pass operation previously has been recently diagnosed as suffering from cancer, according to Musharraf Hossain, General Secretary of Bangladesh Swimming Federation. Musharraf, who is perhaps Bangladesh’s most successful international swimmer, has been maintaining regular contact with Brojen. “He has asked me to go and see him. He says he want to come to Bangladesh”, narrated Mosharraf while talking to DS yesterday. The younger aquaman will be visiting Calcutta next week at the call of his “guru” Mr. Das was the first Bangalee to cross the English Channel following Bangladesh’s independence, Brojen Das was instrumental in organizing the swim federation and has held important official post. Prime Minister Sheik Hasina has contributed Taka one lakhs towards Mr. Das’s therapy and the sports minister is actively considering an application from his family for more grants to meet costs for cancer treatment. 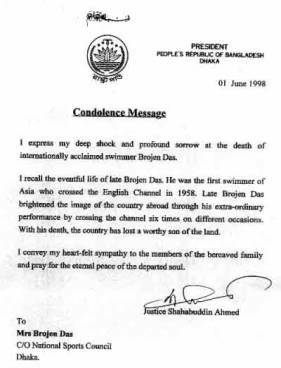 World famous Bangladeshi swimmer Brojen Das died at a clinic in Calcutta yesterday morning. He was 71, reports UNB. Brojen Das who crossed the English Channel six times, was the first Asian swimmer to cross it in 1958. His name was enlisted in the Guinness Book of Records in 1961 for his several world records in swimming. In 1961, he had set three world records in swimming by crossing the English Channel as the fastest man. He crossed the channel six times, establishing two world records at a same time in a day. Brojen Das also achieved tremendous success in three longest international swimming in 1959. His success brought him a long list of awards from home and abroad. He had received the National Award in 1976, “King of Channel”, a special trophy of Swimming Association (UK), “pride of Performance”, and Dhaka University Blue award. Brojen Das was also the lifetime member of Swimming Association (UK) and Royal Life Saving Society (UK), Vice-President of World Long Distance Swimming Association and General Secretary of Bangladesh Swimming Federation. He was born in Kuchiamora village under Sirajdikhan thana of Munshiganj district on December 9, 1927. He left behind his wife, a son and a daughter and host of relatives, admirers and friend to mourn his death. President Shahabuddin Ahmed and Prime Minister Sheik Hasina expressed deep shock at the death of Brojen Das. In a condolence message, the President said that Brojen Das brightened the image of the country abroad through the extra-ordinary performance by crossing the Channel six times on different occasions. “With his death the country has lost a worthy son of the land.” He added. In her condolence message, Prime Minister Sheik Hasina said Brojen Das made swimming popular in the country’s sport arena. “The loss due to the death of this unforgettable and talented sportsman is irreparable.” The Prime Minister conveyed her sympathy to the bereaved family members. Most nations have a number of luminaries lighting up the world in various ways. We had only one in the last two decades. And he is gone. We had before him some endurance swimmer such as Profulla Ghosh and still now have one who can float with chained hands for days on end. But Brojen was the first to achieve anything internationally recognized. And he became a peerless distance swimmer. And after Brojen what? Why with Brojen there Bangladesh couldn’t come of age in swimming. It is not that Brojen kept to himself his training and skill and knowledge. When he first dazzled us with his performance in 100, 200 and 400 meters it was as a member of the Kashipur Swimming Club of Narayanganj. And with his help and guidance that club simply reigned for decades over swimming in the erstwhile Pakistan. Brojen was an utterly likable person. Affable up to eternity. One did not know his particulars, would not suspect, even after a year’s mixing, that he could wade into water or that he was an international celebrity. Practice makes a distance swimmer and it made Brojen. No one ever knew when he did that. Short and dark and average Bangalee at his girth, he was antithesis to all distance swimmer. His determination only outstripped his achievement of being the first Asian to swim the English Channel. He eventually did it in record time and made light of the challenge by doing it both ways in the same day. We propose that at least two Olympic-standard swimming pools be built, one in the capital and another in some city, to commemorate the glory that was Brojen Das. The body of ace swimmer Brojen Das, who crossed the English Channel six times, will be flown in here from Calcutta today, reports BSS. This was disclosed by the Bangladesh Swimming Federation (BSF) yesterday. State Minister for Youth, Sports and Cultural Affairs Obaidul Quader and BSF President Rear Admiral Mohammad Nurul Islam will receive the body at ZIA at 3.40 pm. Prior to the cremation at Postogola cremation ground, the body of the deceased will be kept Jatiya Krira Prishad Bhaban at 5.30 pm. And Sri Loknath Ashram at Swamibag at 6.30 pm. To let his friends and admirers have a last glimpse. Brojen Das, 71, died at a clinic in Calcutta on Monday. He was suffering from leukemia. Meanwhile, a condolence meeting was held at the National Scorts Council (NSC) paying tribute to swimmer celebrity of Bangladesh. NSC Secretary ASM Ali Kabir, General Secretary of Bangladesh Swimming federation Mosharraf Hossain Khan, eminent swimmer Arun Nandi, Swimmer coach Abdul Kader and sports organizer Abdul Tawhid spoke on the occasion. Different sports organization have also expressed their deepest shock at the death of Brojen Das. They are Bangladesh Women Sport Federation, Bangladesh swimming Federation, NSC, Bangladesh Chess Federation and Farashganj Sporting Club. The Funeral of celebrated swimmer Brojen Das was held at the city’s Postagola cremation site last night, reports UNB. Brojen Das died in Calcutta on Monday morning. His body was flown in here by an Indian Aillines at 6.10 pm. Yesterday. State Minister for Information Prof. Adu Sayeed, state Minister for Youth, Sports and Cultural affairs Obaidul Quader and BSF President Rear Admiral Mohammad Nurul Islam received the body at airport. Later, two ministers conveyed the condolence messages of President Shahabuddin Ahmed and Prime Minister Sheik Hasina to the wife of late Brojen Das, who also came from Calcutta by the same flight. The body was then taken to Mirpur National swimming Complex and kept there for few minute. President of Swimming Federation along with the officials, organizers, swimmer and other sportsmen paid homage to the great swimmer. Later, his body was kept at Jatiya Press Club, National Sport Council (NSC), Sree sree Loknath Ashram at Swamibagh in the city before the funeral at Postagola. At the NSC premises, State Minister Obaidul Quader announced that the proposed swimming pool to be constructed in Fatullah will be named after Brojen Das. Obaidul Quader, disclosed this while paying his last respect to “King of Channel” and world record holder Brojen Das at a huge gathering in front of the NSC. A condolence meeting will be held at the Jatiya Press Club on June 8. A new swimming pool to be named after the “King of the Channel” Brojen Das, would be built at Fatullah, Narayanganj State Minister for Youth and Sports Obaidul Quader said yesterday at a cilic meeting condoling the death of Brojen das, reports BSS. Brojen Das earned his feat because of his commitment and devotion, he said and urged sportsmen of the present days to follow the ideals of the great swimmer of the sub-continent. Presided over by Obaidul Quader, who is also chairman of the National Sports Council, the meeting was addressed by Foreign Minister Abdus Samad Azad, state Minister for Foreign affairs Abul Hasan Chowdhury, secretary of the Minister of Youth and sports ASM Shahjahan, president of Bangladesh Swimming Federation and Chief of the Naval Staff Rear Admiral Mohammad Nurul Islam and Mrs. Brojen Das. The speaker paid rich tribute to the legendary swimmer who breathed his last at a clinic in Calcutta on June 1. The Foreign minister in his speech recalled his memories of Brojen Das. The state minister for youth and sports informed the widow of Brojen Das that the government would take care of her if she wants to stay in Bangladesh. Later Quader handed her a cheque of Taka 50, 000.